episode 54 – your one month klaxon! Episode 54 is here and I am very VERY excited that we are one month off of Edinburgh Yarn Festival. Today I have incredible revelations about EYF and The Podcast Lounge. Don’t worry if you can’t get to Edinburgh, I have lots to go round including TWO give-aways, a book review and a yarn review! Click on the logo to visit the website and do sign up for their email newsletter. Listen in for exciting news about the Friday Night Party. I am hugely excited that we have our one month klaxon. While this episode is themed on the Edinburgh Yarn Festival everything I mention here is not exclusively available at the event. I will be bringing you a wee preview of some of the vendors by way of a yarn review, a book review. TWO give-aways and a #NaturesShades prize! Lots for all of you to get involved with and if you can’t get to EYF, you can like vicariously through the podcast. Kate Davies has announced that her next book will be centred on haps….we are hugely excited. 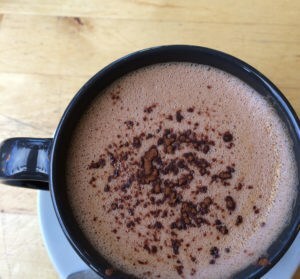 Read her blog here and find out how you can get help get hap-py too! Thanks for your very kind feedback on my Buachaille review – I am please so many were enabled! Kate has been very kind and generous and has given us an Epistropheid Hat kit as a prize. 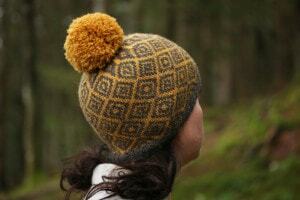 The kit includes the Furze and Squall shades of Buachalle – i have affectionately termed this a FURZEHEID. To be in with a chance of winning head over to the Ravelry group now to enter and get all info. Thank you, Kate! Watch out for Pom Pom Press publishing Joji Locatelli and Veera Välimäki’s Interpretations series in print next! Thanks to them for this lovely book to review and it will be going into the #Naturesshades prize pile! 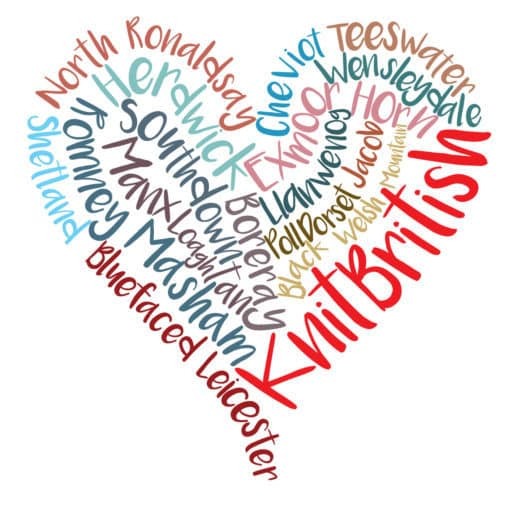 EYF Kick off Knit Night, Thursday 17th March from 4pm. This is going to be at AKVA, at Fountainbridge and will be a lovely opportunity to meet with friends, get sociable and in the EYF spirit and also pick up your wristbands, if you’ve ordered your tickets online. Because this is a public cafe/bar EYF would kindly like an idea of numbers for the venue. There is no cost, but of you plan on attending, please follow this link. Friday Night Partaaaay This year Jo and Mica are throwing a party in true Scottish style, with a CEILIDH! Get your kilts, your tartan and your Highland Dress out because this is going to be really special. Ticket information will be revealed very soon, if you are a newsletter subscriber you should find out there, but keep your eyes on the website, as you will not want to miss this. There will be two different tickets, one for ceilidh only and one which includes a Haggis, neeps and tatties supper before. If you are bringing your non-knitting loved ones to Edinburgh, I bet they would love to attend this slice of awesome Scottish entertainment. I am already looking for a swingy skirt! Don’t worry if you have never been to a ceilidh before, the band – The Picts – have a caller, who will take you through the dances step-by-step, As well as doing the traditional ceilidh music the band do some Celtic rock too! Edinburgh Yarn Festival Magazine Jo and Mica are producing a beautifully bound souvenir publication this year. It is going to be full of beautiful photography and interesting content and with 5 patterns by Ysolda, Gudrun Johnston, Lucy Hague and Karie Westermann. In addition to that the content, yarn, models, etc are all Scottish, or sourced from within Scotland! The magazine will be available to preorder from next week and will cost (only) £8, postage charges will apply. This is an extremely limited print run and when it is gone, it really is gone. What a lovely souvenir of EYF and a little piece that you can own, even if you can’t make it to Edinburgh for the festival. The Blacker Yarns Podcast Lounge, in association with…ME! ooh! Lots to tell you today. I reveal the podcasters who are confirmed as hosting sessions and coming to the podcaster meet up. I will be publishing a full programme next month, but so far….On Friday 18th March, you can expect sessions from Award winning Shiny Bees, Jo Milmine; Lacey to my Cagney, Louise Hunt from Caithness Craft and Queen of Persiscope – and my fellow Online Knitter of the Year – Joeli Creates. On the Saturday you can see Nathan Taylor, The Sockmatician and other events on the Saturday will include a special Designer feature hosted by Cagney and Lacey and Cathy Scott will be on hand with her app testers to show off the new Knitmastery app. On both days we will have a Podcast Meet Up from 12-30-2pm. 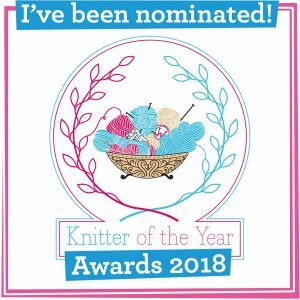 We have more lovely podcasters who are coming; another award winner – Helen Stewart, Curious Handmade will be coming, so will Paula of The Knitting Pipeline podcast. Lydia from The PomCast; The Geeky Girls Knit and Rachel from Yarn in the City are all vending, and KNITSONIK is teaching but we are hoping they can make it to one of the gatherings. We also have Vero, from the very awesome Along the Lanes podcast coming along too and just confirmed too is Kirsty from the Little Bee podcast. If you are a podcaster. 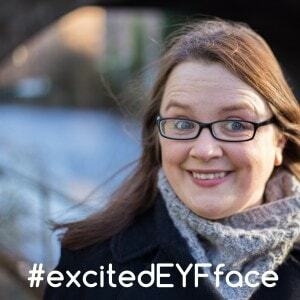 you are going to be attending EYF, and want to join in drop me a line via the contact page! | Musical Interlude – this is a longer episode and so I warrant a knit-based musical interlude. Wensleydale, Cotswold, Teeswater and Leicester Longwool are the luxe, silky, strong longwool yarns that are blended here with a dash of Cornish Mule to add woolliness and yield. I cast on a Vivid square in the DK and I was just so very impressed with how it knitted. The yarn flowed through my fingers and the feel of the wool as I worked it was like creamy silk, yet the strength in the wool is incredible, I put a lot of tensile pressure on the wool before it snapped. It is really wonderful to knit with a wool that has structure and definition, but that is also woolly and creates a very drapey fabric. It shows that Blacker Yarns are very astute craftspeople to create a kind of yarn that will tick boxes for lots of people. Listen in for the full review, as I always say, to hear the full run down. When Tamar is released there will be 17 colours and it will be available in 100g hanks in both 4ply (350m) and DK (220m). It will cost £14.70 per hank. This yarn is really unique and it has a real story to tell about British breeds, supporting rare breeds and how to create a sophisticated yarn that knitter’s will want to unlock the potential of. You will not find a yarn of these blends or this special anywhere else. You can win a skein of Tamar..it’s not even out yet! Check out the entry thread in the Ravelry group – thanks so much to Blacker for this prize! This month I’ve heard of a further two awesome new British wools. Kettle Yarn Co launched Baskerville, which is a 60% Exmoor Blueface, 25% British Gotland and 15% Silk blend. It looks characterful as it looks lustrous and luminous and Linda, from Kettle Yarn Co, has indigo dyed three of the shades, with and undyed shade too. These are very small batch yarns so there are currently pre-orders open on the webshop for the next batch. I hope Linda may have some at EYF, but I won’t set my heart on a skein. 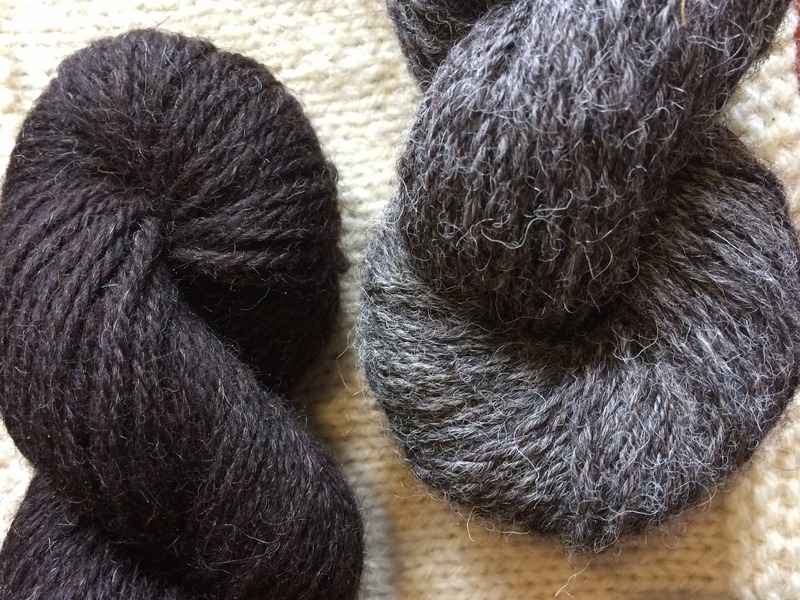 Also, i spied on social media that The Knitting Goddess has been dyeing up her brand new custom spun base – it features TWO British breeds and she will be launching it at EYF! Hoorah! I am joining in with Katya Frankel’s Anything Goes KAL tomorrow, it runs until 30th March and you can knit ANY of Katya’s designs to enter. I am going to double dip with Natures Shades and I’m going to make Ritzy Mitts in various natural undyed shades. You can join in too, if you fancy. There are lots of really interesting designs and lots of accessories, and you can get 20% off (il next sunday) with the code anythinggoeskal at the ravelry checkout. Lots of details and chat in Katya’s Ravelry group. |Next Time I will be back on 11th March, until then, thanks for listening, thank you for all your comments, feedback and chat. Talk soon! Music: Carefree by Kevin McLeod and Singin’ in The Rain (demo) by David Mumford – Both are on FreeMusicArchive and are both shared under Creative Commons Attribution license. The Knitting Song, by Bill Oddie was recorded in 1965 and used with kind appreciation for the lyrics, music, singing and for its passion for knit! In full disclosure while I do work with Katya Frankel, I am taking part in this KAL under my own steam and telling you in case you are interested to take part too – I receive no payment for talking about it or taking part!! Honest Guv! What a dilemma indeed! Maybe you should have switched off and listened to This American Life or a Radio 4 podcast for a wee while, just to even out again, before jumping back in. tee hee! It will be good to see you there! Thank you so much for this fantastic episode, and for all the extensive shownotes! There was so much lovely and interesting information this time, and I love to read it back. But I do know how much work it is, so thank you! Looking forward to meet you in real life at EYF, and feeling your british wool swatches. What a bumper podcast – I had to listen to it in two sections, but just as you were wrapping up on my computer, I was binding off my Buchanan which I can’t wait to wash, block and wear. I am absolutely in love with it and would never have thought to knit it in natural shades if not for your ingenious KAL, so thanks so much. It’s definitely coming with me to EYF which I am just beyond excited about. Just when I thought it couldn’t get any better, you announce there will be a ceilidh! I immediately emailed the three friends I’m travelling up with and they are all game to go. Just can’t wait! The podcast lounge plans sound fantastic, but oh, dear, Blacker has always been my downfall. Maybe I’ll just plunk myself in front of their booth and not move for two days.